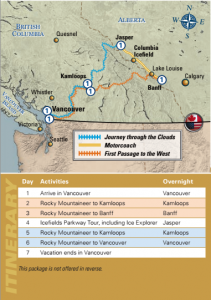 A sample 7-day itinerary from Vancouver with rocky-peak Holidays which takes advantage of current travel specials. 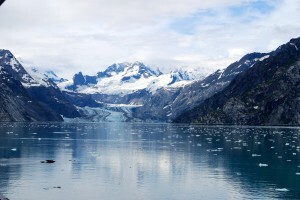 This itinerary can be completely customised and you can easily upgrade to a luxury package. Overnight Train to Jasper departs 20:30. Train arrives Jasper 16:00. Overnight Jasper. Jasper to Banff along the spectacular Icefields Parkway. Snowcoach onto Athabasca glacier included. Overnight Banff. Banff Sightseeing Trip – AM / Lake Louise & Moraine Lake Sightseeing Trip – PM. Overnight Banff. Depart Banff onboard the Rocky Mountaineer Train, RedLeaf Service, to Kamloops. Overnight Kamloops. 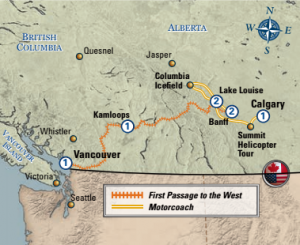 Rocky Mountaineer RedLeaf Service to Vancouver. Overnight Vancouver. Victoria Day Trip from Vancouver. Full day. Overnight Vancouver. Total Discounted Package Price for 2 Adults = CDN$3,990 ($1,995 per person). This rate includes ALL taxes, promotions and discounts. Price will be confirmed at time of booking.